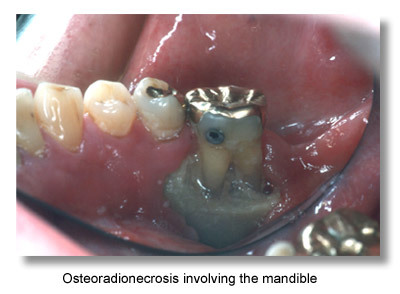 Osteoradionecrosis (ORN) is a condition of nonvital bone in a site of radiation injury. ORN can be spontaneous, but it most commonly results from tissue injury. The absence of reserve reparative capacity is a result of the prior radiation injury. Even apparently innocuous forms of trauma such as denture-related injury, ulcers, or tooth extraction can overwhelm the reparative capacity of the radiation-injured bone. Traditionally, 3 grades of disease (I, II, III) are recognized. Grade I ORN is the most common presentation. 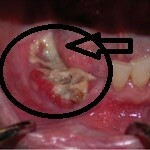 Exposed alveolar bone is observed. Grade II designates ORN that does not respond to hyperbaric oxygen (HBO) therapy and requires sequestrectomy/ saucerization. Grade III is demonstrated by full-thickness involvement and/or pathologic fracture. 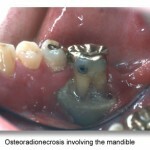 Therefore, patients can demonstrate grade I or grade III ORN at initial presentation. ORN is rare in patients who receive less than 60 gray (Gy) radiation therapy. Patients with ORN who receive less than 60 Gy and more than 50 Gy have been reported, but these cases are extremely rare. The overall incidence of ORN has decreased over the last 3 decades. In general, studies from prior to the 1970s showed an ORN incidence from 5.4-11.8%. More recent studies, however, have placed the incidence closer to 3.0%.The true frequency of ORN is impossible to determine because no mechanism exists for reporting the disease. Incidence is increased in patients who receive combined chemotherapy-radiation. The Radiation Therapy Oncology Group (RTOG) requires their members to report radiation toxicity including ORN; however, the disease is probably under-reported. More valuable than an understanding of frequency is an appreciation for the decrease in reparative capacity in tissue exposed to more than 60 Gy of radiation. progressive endarteritis caused by radiotherapy results in insufficient blood supply (tissue oxygen delivery) to effect normal wound healing. ORN was first described by Marx in 1983 as hypovascularity, hypocellularity, and local tissue hypoxia.Prior to this, many other theories existed regarding the etiology of ORN. The report by Marx, clinical experience, and subsequent research support this now widely accepted theory. The irradiated mandible, periosteum, and overlying soft tissue undergo hyperemia, inflammation, and endarteritis. These conditions ultimately lead to thrombosis, cellular death, progressive hypovascularity, and fibrosis. The radiated bed is hypocellular and devoid of fibroblasts, osteoblasts, and undifferentiated osteocompetent cells. 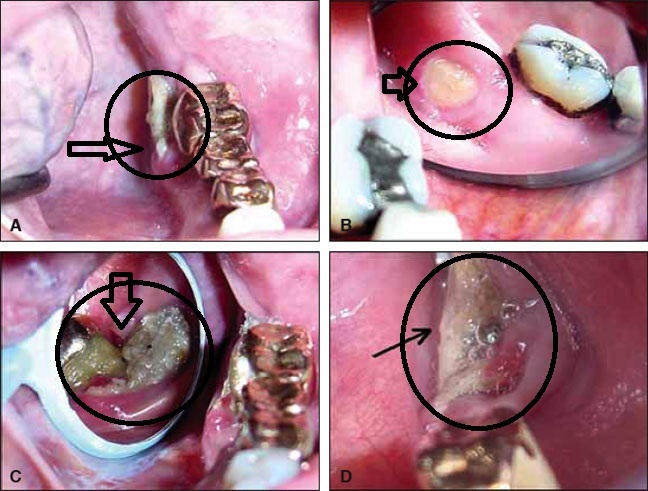 Mandibular ORN develops most commonly after local trauma, such as dental extractions, biopsies, related cancer surgery, and periodontal procedures, but it may also occur spontaneously. The initial effects of radiotherapy to the oral tissues such as mucositis and loss of taste are troublesome but short lived resolving within a few weeks. Xerostomia may be more persistent but can be managed with supportive therapy such as sialogues and artificial saliva. On physical examination, missing hair follicles, surface texture changes, and color changes are common findings that assist clinicians in assessment of the area of radiation injury. cortical necrosis with sequestrum formation and periosteal fibrosis with a tendency to detach from the cortex. In the elderly, the inferior alveolar artery’s flow to the mandible diminishes and the periosteum and muscle attachments predominate as the primary blood supply. The thrombosis of the inferior alveolar artery and surgical disruption of this soft tissue blood supply may contribute to the development of osteoradionecrosis (ORN). The patient should have a full dental evaluation. This should include radiographs to show all the teeth as well as the jaws to check for unerupted teeth and any bony pathology. A panoral radiograph should be a minimum but ideally, periapical views of all the teeth should be taken. All the teeth should be meticulously charted for caries and periodontal pocketing. Each tooth should be given an individual prognosis and a treatment plan completed and discussed with the patient. 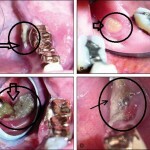 It is important to educate the patient regarding meticulous oral hygiene and the need for life long regular follow up. The patient’s motivation and compliance should be taken into account when assessing which teeth can be salvaged and which should be removed. All teeth should be cleaned and scaled. The patient should be encouraged to rinse with a fluoride and antibacterial mouth wash on a regular basis and high risk patients should have custom trays made to assist in regular fluoride treatment. Patients with no teeth are easier to treat but should still have a baseline radiographic evaluation to check for buried teeth. Dentures should be inspected for fitting to ensure minimal trauma to the tissues. 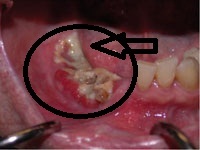 This entry was posted in Oral Care and tagged endarteritis, hyperbaric oxygen therapy, hypovascularity, loss of taste, oral cavity, osteoradionecrosis, radiation therapy, sequestrum, soft tissue necrosis, Xerostomia on December 29, 2011 by chzechze.